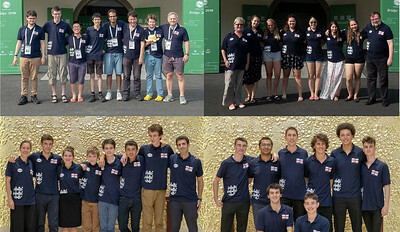 That all four England teams qualified for the competition exceeded all expectations, so their performances in competing among the elite of world junior bridge, against countries where bridge is given far more importance in the national curriculum, is a credit to the players and their coaches. Whilst there will be a sense of disappointment in the squad that none of the teams progressed to the quarter finals, we can all be proud of their efforts, and be confident that England has a bright future in international junior bridge. Only a few of those in China will be too old to play in the 2020 WYTC, so the squads will be looking to use this event as a springboard to compete for medals at future events. Consolation events: The U16s led in the early stages of their consolation event, but with little to lose the other teams got more and more wild, and England slipped out of the top places. So they may not leave with any honours, but as Giorgio writes in his final blog, it has been "an amazing experience" for the team, and he gives his sincere thanks to all the supporters, particularly their sponsors Tetragon and No Fear Bridge, for making it possible. In the Transnational BAM (point-a-board) competition, the England U20 Lions finished 10th and the Ingerland team (the U26s) in 11th. We would again like to thank everyone who has contributed to the fundraising. The response has been fantastic – not only because it has provided financial support but also because it has emphasized the importance that the membership places on junior bridge, giving a boost to all of those involved in knowing that they are appreciated. If you intend making a donation, but haven't yet had chance to do so, please note that the donation page on the EBED website will be closed at the end of August. You could still donate by other means, but if you want to ensure gift aid is included, please use that donation page before the end of the month. For the full schedule use the results page.